1. 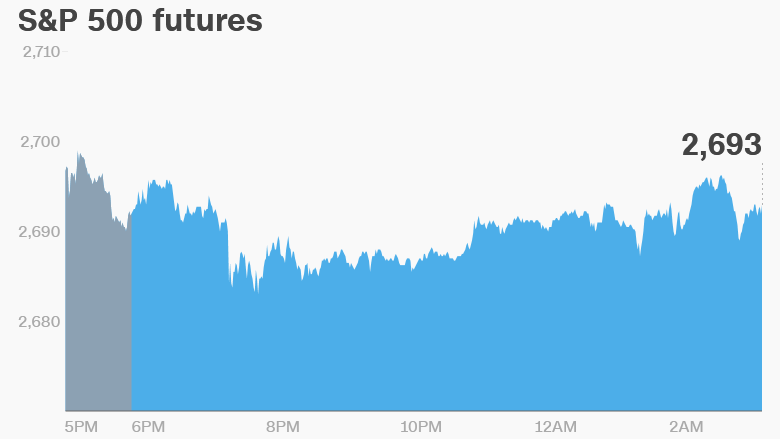 Negative sentiment takes hold: US stock futures are pointing down again, indicating it could be another negative day on Wall Street. The Dow Jones industrial average and S&P 500 have declined for the past two consecutive days. The Nasdaq has ended down three days in a row. European markets are also falling in early trading, with Germany's Dax index leading the way with a 1.1% drop. The Ifo business climate index released Thursday showed a considerable cooling in business sentiment in February. Most Asian markets ended the day in the red. But major Chinese indexes bucked the trend, closing higher on the first day of trading after a holiday. U.S. Treasury yields continue to sit near four-year highs around 2.9%, providing an increasingly tempting alternative to stocks. 2. Germany's diesel ruling: The highest court in Germany will rule later Thursday on whether big cities such as Stuttgart and Duesseldorf should introduce strict limits on diesel vehicles, or possibly outright bans. German drivers and automakers -- including Volkswagen (VLKAY), BMW (BMWYY) and Mercedes Benz-maker Daimler (DDAIF) -- have been bracing for bans in some cities due to growing concern about air pollution and its impact on health. About 40% of cars in Europe use diesel, according to the European Automobile Manufacturers' Association. 3. Earnings: Chesapeake Energy (CHK), Gildan Activewear (GIL), Hormel Foods (HRL) and JAKKS Pacific (JAKK) are releasing earnings before the open Thursday. Then GoDaddy (GDDY), Herbalife (HLF), Hewlett Packard Enterprise (HPE), HP (HPQ), Intuit (INTU), Planet Fitness (PLNT), Red Robin Gourmet (RRGB) and Wingstop (WING) are set to release earnings after the close. 4. Market movers -- Qantas, Barclays, Ruger, British American Tobacco: Shares in Qantas (QABSY) soared by nearly 6% on Thursday after the Australian airline reported well-received half-year results. Shares in Barclays (BCS) are also rising by about 5% in London as investors cheered the company's annual report. Shares in gun manufacturer Sturm Ruger (RGR) are expected to dip a bit when trading opens in the US. The company said on Wednesday that net sales fell 27% in the fourth quarter of 2017, and profits were nearly cut in half. The company, which makes a wide variety of handguns and rifles, said weaker demand was partly to blame. One of the worst performers is British American Tobacco (BTI). Its stock is down by about 5% in London after the cigarette maker reported disappointing annual results.